The idea for a Rifts character generator started back in 2000, but the lack of resources and no knowledge of programming, keep the Rifts character generator a sketch in my notebook for quite a few years. Palladium Books had originally created a Game Master application, but unfortunately the project was canceled with only a version one of the application. In the spirit of carring on the torch, whether wanted or unwanted by Palladium Books (hopefully wanted), I have come up with a character generator application as the beginning of hopefully a group of Rifts based applications with the players and GMs in mind. Fixed save issue, can now save/open .rpc files. Unfortunately previously saved files will not open with this update or future updates. Fixed compiled bonuses for skills and stats. New enter existing character feature. Skill selection cleaned up and separated for easier viewing (Base skills, Related skills, Secondary skills). Fix for stat bonus overload, for skills, OCC/RCC, and combat style bonuses. Optional settings available under Tools>>Options. Newest install has version for x64 Vista systems, may work on Windows 7 but not tested yet. Can view skills without choosing an OCC/RCC or if don't have any skill slots available. 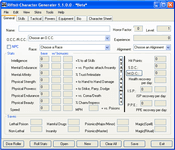 There are limits or restrictions to what spells you can select at character creation. Gives a restriction warning when OCC minimum attributes are not met. Free Language/W.P. skill(s) don't disappear from the list as more skills are selected. You can select the same spell multiple times is now fixed so only the spells you don't have will be added. Race dropdown box fixed for when choosing from an R.C.C. back to an O.C.C. When pressing the Show All button in the Enhancements tab under the Equipment section generated this error is now addressed and fixed. Fix for the default equipment choices. Update main menu button now active to receive new updates without having to reinstall the entire application.